Your blog at http://aerator.blogspot.com/ has been reviewed and confirmed as in violation of our Terms of Service for: SPAM. In accordance to these terms, we've removed the blog and the URL is no longer accessible. Click on that Restore link and complete the captcha (word verification) in the resulting window to verify you are human. Step 3: Post a report in Blogger Help Forum: Something is broken and wait 2 days. Remember to "Favorite" that thread and/or copy-paste the thread URL into a Notepad file to save somewhere safe for future reference so that you can get back to that thread when you need to. Incidentally, in that thread, I had mentioned in passing that the blog has an original innovation for its content and I do not know if that helped, but for sure, it would not harm my quest to get the blog restored. Step 4. If after 2 days your blog has still not been restored, go back to that thread and bump it up with an appeal to any Blog*Star to help escalate it to a Blogger Employee and then wait and pray. liked your blo so much, tell me about the navigation bar i mean how to make a navigatin bar below header the same that you have made? ooooooh i'm astonished by your quick reply thank you very much ! This a very nice of you to share ways to restore the deleted blog coz of SPAM flag but I would like to share that I have one of my blogs deleted coz they think that it violates TOS, SPAM, while all of the contents was written by me and it is beyond my expectation that it will be a SPAM. I even bought a domain name for that blog and as the result I lost the blog and the domain. I try to restore it several time then appeal and last step is posting on blogger help forum. Guess what? Nothing after nothing until now. I should be more that 6 months after several try. Now I decided to move most of my existing blog to self-host running on Wordpress. Anyway I really love blogger and I strongly hope that they will try to enhance its service. I do afraid that my other blogs will be deleted again and I will lose all of the afford spending on those blogs. Be a better man, blogger.com! You still have the URL of the thread over at Blogger Help Forum? If so, do send me its URL. Also URL of your deleted blog if you still have it. Here's hoping. Is there anything else I can do? Great thread by the way, really helpful. You have done Step 1 and 2. You can still do Step 3 (post to Blogger Help Forum) and Step 4 if 1,2,3 didn't give the desired result. Yes wait 2 days before bumping up the thread if blog still not restored. gmail not validate my account. it always ask for verify a/c. Your blog was helpful. I am worried sick bcz my blog got deleted today morning. It is a work from home related blog, but no reason to be a SPAM. Did all the steps u told. keeping an eye on my thread in the forum and eagerly waiting for 2 days to pass. Thanks a lot for ur help !!!! The blog mentioned above serving lot of candidates preparing for public examinations conducted in India.. nearly 2000 email subscription and about 300 followers .. they are all asking why the blog deleted ?..it s great shame to me.. pls do the needful and restore my deleted blog misunderstood by robotic programs as Spam blog. Step 3 : Posted a question on bloggers help forum. Thank you for this post. My blog was deleted very recently and I found your post EXTREMELY helpful. I've followed the steps you outlined. Hopefully, my blog will be reinstated in a few days as it's definitely not a spam blog. Thank you for allowing me to post here.Couple of my blogs were deleted while i was updating them and its been over 2 months and everytime i do the verification thing for google to resinstate my blogs as they are not spam.hope posting at your blog will somehow help my blogs to recover. I have applied for restoroation of my blog (www.indianmp4movies.blogspot.com) today ! Now looking for official staff replies ! In the beginning, I would like to thank you much about this great blog. It is rely useful and helpful resource for blogger users. You can find many things here. Thanks once again. was deleted by blogger because they say, I have violated our TOS. I did all your above steps and I'm waiting for their response. I hop to get it back and I hop to help my get it back. Thanks much for you. When was your blog deleted? If it is not splog or violate TOS it may take some time before it gets deleted. If it takes too long, leave a comment again so that I can escalate it to a Blogger Employee. My blog was deleted since 2 days ago. It is deleted also from the dashboard,it's restore access is no longer available on the dashboard. We'd like to inform you that we've received another complaint regarding your blog (http://learn-english-onlinecourses.blogspot.com/). Upon review of your account, we've noted that your blog has repeatedly violated Blogger's Terms of Service (http://www.blogger.com/terms.g). Given that we've provided you with several warnings of these violations and advised you of our policy towards repeat infringers, we've been forced to remove your blog. That is a very strong message which I have never seen before and sound serious. I am not clear about what was the cause of deletion and the only thing I can do is to refer you to the Blogger Help Forum or to ask you to complete all the steps that is listed in this post. Thank you for your help. I have also lost my blog recently for it being incorrectly labeled as spam. (http://www.cash-crate-surveys.blogspot.com) I had put a lot of time and effort into this blog over the years to have it just taken away. I have followed you above steps and posted in the blogger help forum (http://www.google.com/support/forum/p/blogger/thread?tid=0ce7ad128fbfb8c2&hl=en). Now to cross my fingers. If I cannot get it restored, is there a way to at least get my content? I am just heartbroken over this. My Blog Only Contains Pictures And Good Content,it is Not A Spam Blog.Plz Help Me!!!!!!!! pls do the needful and restore my deleted blog misunderstood by robotic programs as Spam blog. It was deleted in the beginning of December, I was just referred to your site yesterday. I have completed all the steps, so I will wait the 2 days and bump my post. Thank you for the info about backing up as well. If it is restored, that is the first thing I will do! I am afraid that using your own domain with Blogger does not stop them from deleting your blog because the blog is hosted on their servers IF it really is a spam blog or violates their TOS (free Wordpress.com blog too get deleted) and the only way you can be sure is to start a Wordpress.org blog and host the blog yourself which means you will have pay hosting charges. MAN PLEASE HELP ME!! I have a different case, I have received several mails of blogger of copyright infrigement, here is what the mail said !We'd like to inform you that we've received another complaint regarding your blog (http://tomorrowmusic11.blogspot.com/). Upon review of your account, we've noted that your blog has repeatedly violated Blogger's Terms of Service (http://www.blogger.com/terms.g). Given that we've provided you with several warnings of these violations and advised you of our policy towards repeat infringers, we've been forced to remove your blog." lc, sounds like you have infringed on other people's copyright and thus violated Blogger TOS and if that is true, only you can help yourself. As per Adsense, that I believe is independent of Blogger's account (unless you got your Adsense account via Blogger itself? I don't know) but if your Adsense account is suspended whatever earnings that had not yet been paid out will not be sent to you. I am sorry I cannot give you better news. I did exactly what you told .But, still now, I didn't get any message from Google.Every weeks, I can click on Restore Access to this blog and it was like a new .Today, I did that again.Did all 4 Steps. But, my Blog http://www.cutemyanmarmodels.blogspot.com) is Still Blocking. It is the third times I tried that 4 steps. Waiting For Review again. Someone requested a complaint against my tricksmahal blog that i'm copying his posts in my blog. i had copied around 4-5 posts in march-2011 but after that i regularly update my blog with my own new postings. but dat tym i was not able to access net so i didnt deleted that 4-5 posts. now DMCA has removed my blog. i have done a very hard work on this blog. please please help me sir. many people are experiencing the same problem. what is the real cause of removed blog because of spam robot? I LOOKED AT THE TOS AND I AM NOT IN VIOLATION OF ANY OF THEM. THIS BLOG WAS STARTED IN DEC 2007 AND HAD 300 ENTERIES ABOUT MY FLORIDA CONDO. My blog has all our condo documents posted for residents to review and there are updates on condos for sale, foreclosures etc. THIS REMOVAL OF THE BLOG IS EXTREMELY HIGH HANDED AND RUDE AND IT IS NOT APPRECIATED AT ALL. I HAVE 5 YEARS OF TIME AND EFFORT IN THIS BLOG AND IT JUST DISAPPEARS! WHAT NONSENSE and it seems impossible to actually get to someone at the company! Does anyone have their actual address or a phone number where someone can write or call to the President or CEO and complain about this? I am very sorry about the situation you are in which may happen to any of us because of Blogger generosity in providing free service plus the numerous others who abused it forcing adoption of robotic programs to try to stem it out. Personal information? Perhaps Blogger is trying to protect you but I don't know. What you have to do is, if there is a link in the email to click to ask for review, do it. Or there may be a link in your Dashboard to request review. A third possibility would be to post to Blogger Help Forum and perhaps any of us Top Contributors may escalate it to the attention of Blogger if deemed warranted. Nitecrurz is particularly active in this area. Count me as another victim of the Blogger bots after more than four years using the platform. 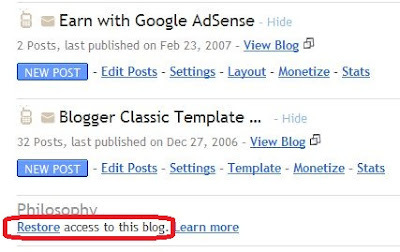 Following a successful email round to my iContact opt-in list last week, which resulted in about 400 reads of my latest post, Blogger locked down tenserstirades.blogspot.com without notice or explanation. Visitors now encounter an ominous screen claiming "Terms of Service" violation. This is damaging to my professional reputation. I've been forced to deny other influential publishers from linking to my popular post, costing me reads and credibility. As an ethical blogger I am needless to say highly motivated to identify the source of the problem and correct it. I was shocked to discover that this is impossible, given the Blogger process. There is nobody to contact, only a hard-to-find button labeled "Request Unlock Review" which once clicked, goes gray and dormant. After a full week with zero notification, communication, or explanation, my blog remains out of business. Blogger is effectively firing me as a customer - a fact that I will be obligated to inform my 3,800-member mailing list after I transfer to an alternate platform. Peter you seem like one of the few informed sources about how Blogger does things. Can you suggest anything at all that could lead me to a different conclusion?